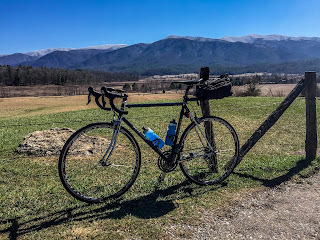 Nice long ride from our house in Gatlinburg to Cades Cove, once around the loop, and back. Felt great. That's probably the longest ride I've done since late December. Considered going longer but didn't want to overdue it. I'll do some hiking on Sunday before driving home and will do some recovery miles tomorrow evening. Training too little, too much or just right? HOW MUCH SHOULD YOU TRAIN? How much should you train? The answer: Probably not as much as you think. My friend and fellow cycling coach Neal Henderson says that 65% of the athletes he sees train too much, 25% train too little and 10% get it right – the pros who are paid to perform. Henderson is the head of Apex Coaching and was named the 2009 USA Cycling Coach of the Year. He coaches clients ranging from novices to World and Olympic champions. And he says only 10% of his clients train the proper amount! What should be your training goal? Important point: your body (and your performance) only improves if you give your body time to recover. Your body won’t increase contractile force, repair muscle damage or create new mitochondria (where fat is metabolized to produce energy for endurance) if you don’t allow it to recover. For more detail on proper and adequate recovery, see my eArticle Optimal Recovery for Improved Performance. What happens if you ask too much? You could develop an overuse injury from muscles and/or connective tissues that aren’t strong enough to handle the overload. Or you could get sick. Or you could ask your body to do so much that it can’t compensate quickly and get fitter. This is called overreaching, and you might not ride as well for a week or so, after which your body can return to where it was and then get stronger. But overreaching can easily develop into overtraining, from which it could take you weeks or even months to recover. How do you know if you’re overtraining? The key indicator is declining performance. Everybody has an off day. But if you’re not riding as fast or climbing as well, for example, watch out! The other key indicator is your mood. We all have a day here and there when we blow off a workout or just don't feel like riding. But if you think, “I really don’t want to train, or ride!” for several days, conider yourself warned. Too often, a roadie responds to either of these key indicators by forcing himself or herself to get out there and ride – which is exactly the wrong response! If performance drops significantly and/or you aren’t excited about riding, take a few days off before you fall into overtraining. Since you need to overload your body in order to improve, how do you manage your training so that you don’t ask too much of it and do, in fact, improve? According to the Pareto Principle, 80% of the benefit comes from the first 20% of the effort. Doing more training only brings marginal gains and risks the problems described above. Brent Bookwalter, who rides for BMC, advises that if you have a choice between an extra 20 minutes of riding or spending that time recovering, do the recovery. (VeloNews, June 2015) More training only brings marginal gains; however, more recovery brings greater gains. 1. Volume: If you’ve been averaging four hours a week of riding this winter, then to continue to improve you need to ride more. 2. Duration: If your longest rides this winter have been 90 minutes, then to continue to improve you need to ride longer. 3. Frequency: In general, you need to ride three times a week to maintain fitness and at least four times a week to improve. If you’ve been averaging three days a week then you need to add another day. 4. Modality: If you’ve been doing strength training three times a week and then switch to riding (only), just changing the mode overloads your body. Although you’re using many of the same muscles riding, the movement patterns are different than in the gym. 5. Intensity: Conversational endurance rides are the foundation of all training. However, if this is all you’ve been doing, then you need to include some intensity in your training. Change only one of these variables at a time to avoid overreaching and overtraining. Change slowly. For example, only increase your volume by 10% or so a week. Intensity is like prescription medicine. Taken in the right amount, you improve. Not enough and you don’t get better. Too much and you get worse. Take the wrong medicine and something different may happen to your body! Here are a couple of good examples from VeloNews. Most amateurs tend to ride at about the same intensity or spend too much time doing very hard riding or add intensity rides without reducing endurance riding. Because intensity riding increases the total overload on your body a lot, just adding it to your regimen risks overreaching. Instead, cut back on total volume at the same time as you add intensity. Inspired by Sir Bradley Wiggins’ record-setting hour time trial, VeloNews Managing Editor Chris Case decided to do his own one-hour TT on the track. He already had a good endurance base. For seven weeks he prepared with only two short intensity sessions a week, fully rested for each. The rest of the week he did two or three one- to two-hour rides. 1. Oxidative aerobic system (low power / long duration). Each system responds to different types of training. The mix of fiber types is determined genetically and varies by individual. Although you can’t change the mix of types, you can focus your training on a specific type, depending on your goals. One final note: I’m writing a new eArticle for RBR tentatively titled: Intensity Training for Cyclists: Using a Heart Rate Monitor, Power Meter and Perceived Exertion to Maximize Training Effectiveness. Look for it soon. I used the crit course so I had some consistent up/down on these. Held 335, 330 and 309. Kind of died on that last one. Cadence did go up from 85 to 87 to 90 on each of the 12 minute efforts. I think I just couldn't push he bigger gear up the hill so I went to slightly higher cadence. I also think that given Mondays and Wednesday spin/strength class and intervals the last two days, my legs were a little tired. NP for 45 minutes at 306...so so effort there. I'll go light tomorrow as I have some meetings and other events. I'll get the 2 hours in on Sunday, maybe more. Going to 60 tomorrow and mid 50's on Sunday. Yes! I did the 3x12 steady states today along Riverside Drive. I was little sore from yesterdays strength class but not sure it affected my power too much. You'll find the 12 minutes broken into 2x6 with 15 seconds between as I did the u-turn in the road. I took 3 minutes +/- between the 12 minutes. Cadence all all fell right at 88. Power was 339/341, 341/341, and 344/339. Was shooting for 345-350. I'll get there. Still cold, low 40's. With temperatures headed into the upper 50's and near 60 this weekend, after 4" of snow just two mights ago, there should be some opportunities to get outside to ride. After several weeks inside doing all of my interval training, it'll be nice to see some scenery going by. I'm optimistic that my power outside will be a little higher than wheat I've been doing inside for comparable efforts. Inside power has been fine but outside is typically higher for any given effort. With the start of spring being March 1 in my mind, its a good time to look at the winter training to see what went well and maybe what didn't. Overall, the strength training component has been very strong. From head to toe, I feel as strong as ever. on the bike I've been taking the rest days as recommended and trying to get more sleep. using the indoor time trials as a barometer, power seems to be as high if not a little better than last year. Training power inside is a little lower but outside power, when able to get out, has been as good if not a little higher than last year. Getting through the winter and coming out as strong as the previous year is ok, especially riding as a 54 year old. Busy week so I didn't post much but it was typical as far as training: Monday spin in the am and circuit in the pm; Tuesday off; Wednesday spin and circuit consecutively in the am; Thursday off; Friday, 3x12 minutes at 330+. Took my Giant Trinity in to the shop to replace the tires. I'll be going with the Specialized cotton Turbo's, rear tubular, front clincher. Also doing some work on the bars to create some space between the arm pads/bars and the lower basebar. I've added a lot of clients lately and most are all over the strength aspect of the training. Glad to see that catching on. Rode a 14:28, my best ever at that event by about 6 seconds. CompuTrainer had me at 389 watts. HR at 168 avg, max at 180 (known max of 182). Cadence at 94. Had a good warmup and felt very steady from start to finish on the tt. I stayed focus on the power on the big screen and never looked at my HR. Occasionally I glanced at the cadence. peak power: 30 seconds at 444, 1 minute at 404, both at the end. 1. Always wear your helmet, even when just testing your bike in the driveway, riding between your car and the registration booth at a race/event, etc. Always put the helmet on. 2. Use lights always: We have daytime running lights on cars so do the same on your bike. Front and rear lights always on can only help make you more noticeable. 3. Wear bright clothes: The typical black bibs/shorts may be unavoidable but use brightly colored jerseys and jackets. 4. Use a mirror: Its amazing to me how few riders use a helmet mounted, eye-glass mounted or bar-end mounted mirror. You wouldn't drive your car without one so why ride without one? I use mine in time trials unless the road is closed (the eye glass mounted type). In casual riding, training and racing, I glance back when I hear cars approaching. I use it to change lanes although I still turn and look. It's indispensable when turning left and you have to stop in a non-turn lane. Its also a great way to know if riders are dropping off the pace. Mirrors aren't regarded as 'cool' since the racing crowd would never wear a mirror when training but I think they are essential to safe riding on roads. 5. Take the lane: If there are two lanes in your direction and not enough space along the white line/curb to ride and allow cars to pass, take the lane, and make it obvious. On single lane roads I try to stay close to the white line to allow traffic to pass but if it looks like I may get squeezed when opposing traffic would cause a passing car to push me off the road, I'll take the lane until things are clear. 6. If possible ride outside the white line: No need to take the lane when the shoulder is wide enough for a bike. Cars will love you for it. 7. Never run red lights or stop signs: It's dangerous and will just make the other users of the road mad. It gives us all a bad reputation. Act like a car and drivers will treat you like one. 8. Left hand turns are very dangerous: A mirror helps since you're standing or balancing while traffic approaches behind you. Be emphatic with your hand signals. I've bailed on left hand turns if traffic is too heavy. If needed, a few right hand turns will work just as well. 9. Never go through an intersection without looking both ways just to be sure no side traffic is coming. It's little consolation knowing you had the right of way when a car hits you. 10. Pick times of the day to ride with lighter traffic like early mornings before rush hour, mid mornings, or after evening rush hour. 11. Pick your roads: While bikes are allowed on most roads that doesn't mean these roads are safe. I'd rather add some miles (thats always good) by taking out of the way and lightly traveled roads. 12. Keep your head up: Running into a vehicle or stationary object because you were head down is completely avoidable. Look ahead, always. 13. Do your interval training on the safest roads possible: Concentrating on power, HR, cadence, etc is distracting. Trying to deal with heavy traffic at the same time add's substantial risks. Pick your roads carefully. 14. Never get into it with a motorist unless you are immediately physically threatened. A driver who passes by and honks or yells trying to frighten us is just an idiot. Let it go. Someone trying to run us off the road is a direct threat but they'll likely keep going. If you get the license plate, turn it in to the police. They may or may not do anything (likely not). Someone stopping and making threats should be avoided. Try to defuse the situation. You never know what they have in mind or have on them. Then again, should they become physical, you just go for it defending yourself. Most of the general population is pretty out of shape. Go for the larynx. The Survive Institute says its the best way to stop someone. It may be worth the 'are you willing to take the chance that I may be an off duty cop' comment to scare them off. You didn't say you were, just that you might be. I've actually used this locally and in Great Smoky Mountain Park. In the latter, some college idiots drove by me and tried to scare me by hanging out the window and swerving their vehicle. I happen to see them not far up the road at an overlook. I mentioned that I might be an off duty ranger. They all of a sudden became very apologetic. 15. Use hand signals: Let drivers know your intentions. Cyclists, when driving a vehicle, may have a better sense of what a fellow cyclist is going to do o the road but to most drivers we're just another road obstacle they have to worry about. Be obvious with your turn signals, when stopping, etc. 16. Make eye contact: This is an add-on to #15. make sure people see you and acknowledge you. This file contains the last two days of rides. The last half is todays effort with 3x3 minutes at around tt pace with average power at 351, 361 and 363. Feeling pretty good for tomorrows effort. Decided to go outside today. It was a brisk 33 degrees. I had my new arctic-ready pants, my lobster claw gloves and multiple upper layers of both thermal and wind protection. And still, 6 hours later, I'm still cold. I'm going to use our hot tub like a human crock pot later tonight. Anyway, I did 11 minutes at 311, 10 at 310, 5 at 301, 4 at 367 (up my short climb I use for the power intervals) and 5 at 296 doing a few laps around the park crit course. Not my best work but I have say that I was (besides cold) pretty tired from yesterday two hours of spin and circuit, or as the few who do both with me call it, Pete and Re-Pete. I'll relax tomorrow. I did post a lot of tt dates on the schedule. Still need the Ohio USAC tt date and the KY Senior date.